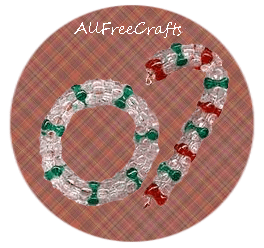 Tri-beads lock nicely together, making assembly for this pair of beaded Christmas ornaments fairly easy. The number of beads required, will depend on the desired size. Cut a piece of wire about 1 inch larger than the size you would like your wreath or cane to be. For the Cane: Create a loop at one end of your wire. This loop will hold the beads and prevent them from falling off the wire. Feed your beads onto the wire. Using pliers twist the opposite wire end into a loop, to secure the strand of beads. Bend your ornament into a cane shape. For the Wreath: Feed beads onto wire until desired size is achieved. Using pliers, twist the two wire ends together to secure and tuck the wire between the beads to hide. Using tri-beads will help in forming a perfect circle as these beads lock into each other.